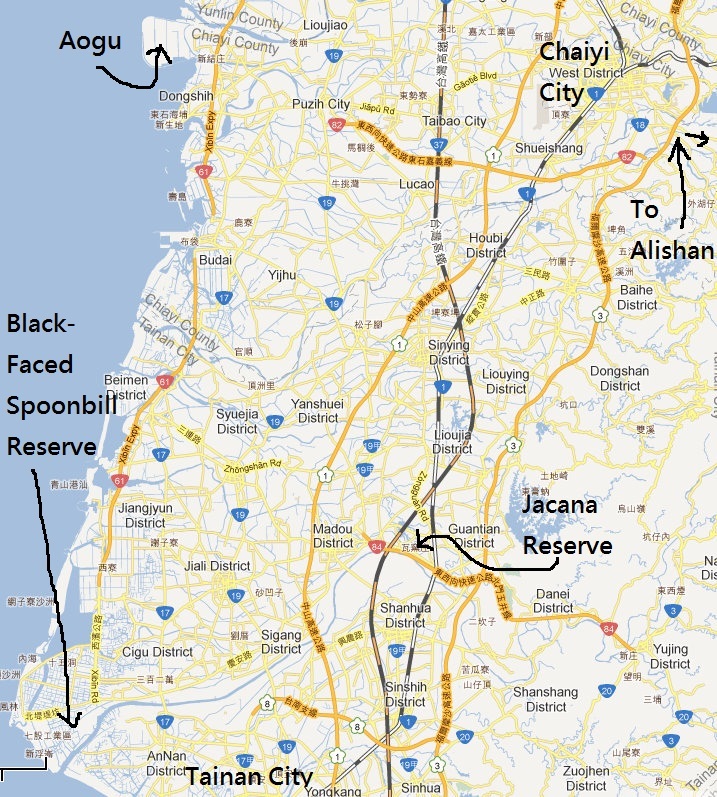 Birding Taiwan: Oh go to Aogu! The day started damp with light rain as I drove north from Tainan. On arriving at Aogu at 10am the weather was dry and cool - perfect for a full day my first full day of birding this year. Most birds were seen from the road running alongside the South, West and North levees, the roads and viewpoint in the center were relatively unproductive.The inner section of the reserve is not yet officially open to the public, some creative navigation is needed to get around the closed entrance. 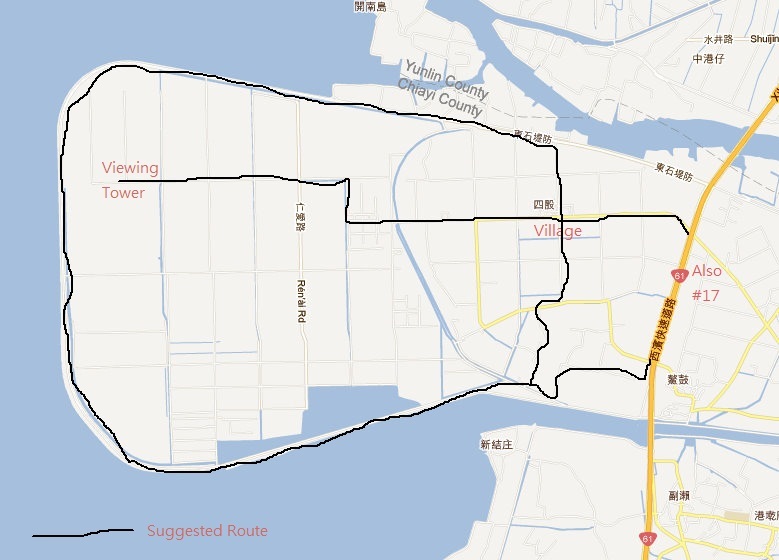 Aogu is a wetland jutting into the sea in Chiayi County. Originally farmland reclaimed from the sea, it is now being being turned into a wildlife reserve and forest recreation area. 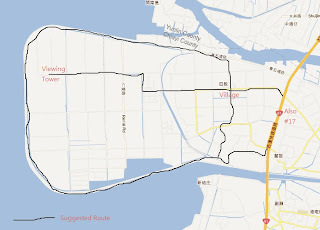 It is easily accessed from Chiayi or Tainan. The very empty and fast Expressway #61 (or an extension of it) starts near the Black-faced Spoonbill reserve in Qigu (Chigu, Cigu). If driving north, exit at the sign for Dongshr, follow the road alongside the highway for a couple kilometers, turn left at the bilingual sign for Aogu Wetlands. Coming south on #61, the exit for the Wetlands are well signposted in English. Be aware some of the roads in the middle of the reserve are unsurfaced. I suggest following the circular road - clearly marked as a cycle route. 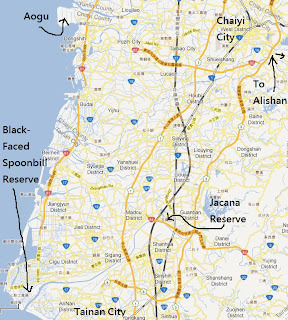 East-west Expressway #84 now links inland Tainan County (Yujing etc) with Freeways #1 and #3, with Guantien (Pheasant-tailed Jacana Reserve, exit Xizhuang). When finished it will link up with #61 at Beimen. Very useful for birders in a hurry - but not many other people! Be sure to pick up the free maps at tourist information counters: entire Taiwan, and 4 regional maps. Several possible candidates, but the bird of the day must be the Pacific Reef-Heron - obviously the dark morph, generally uncommon and rare on Taiwan’s west coast I think. Only one seen but it behaved very well at close range. The list below is fairly typical. Aogu is best in winter and migration time. Happy to guide visitors there - if short on time coming from Taipei, meet me at the High Speed Rail station in Chiayi. House Swift Apus nipalensis "Taiwan Endemic Subspecies (A. n. kuntzi)"
Plain Prinia Prinia inornata "Taiwan Endemic Subspecies (P. i. flavirostris)"
Also birds from yesterday - Rock Pigeon, White-backed Woodpecker, Black Drongo, Light-vented Bulbul, Little Egret, Eurasian Tree Sparrow, Daurian Redstart.